With the projected expansion of the biosimilars market, there will be an increased propensity for the substitution of reference biological products with cheaper biosimilars for economic reasons (ie, non-medical switching). This will lower the cost per patient and should provide the benefit of wider access to biological therapies. However, it is essential that patients and clinicians fully understand the rationale for non-medical switching and its potential implications in terms of efficacy, safety, and immunogenicity. To date, clinical experience supports the use of biosimilars and a growing body of evidence from clinical trials and real world observational studies specifically supports clinical decision making around non-medical switching. Equally, as non-medical switching becomes more common, it is essential that pharmacovigilance systems adapt to handle the increasing volumes of data needed to effectively monitor the use of biosimilars and detect new signals. This will require a reduced reliance on registries, as well as streamlining and integration of existing systems to allow a frequent cycle of online reporting of adverse events by healthcare professionals, analysis by national authorities, and feedback to treating clinicians. This article considers the current use and future uptake of biosimilars from a clinical perspective. In the context of biological therapies, switching can refer to a change from one reference biologic to an alternative biologic, between a reference biologic and a biosimilar (or vice versa), or between two different biosimilars of the same reference biologic. From a clinical standpoint, each of these options could be used for different reasons and have potentially different consequences. As an aid to understanding the different options, switching can be sub-categorised into medical switching and non-medical switching. Medical switching, whereby one medication is exchanged for another at the discretion of the prescribing physician, is performed with the goal of optimising treatment benefit, improving convenience, or minimising adverse events.5 In most instances, a different reference biologic is introduced after the first biologic has failed, and patients usually remain on the substitute biologic. Evidence based recommendations to guide clinicians in the medical switching of biologics are available for several conditions, including rheumatoid arthritis6 7 and Crohn’s disease.8 These guidelines recommend that patients who experience an inadequate response or an intolerable adverse event during treatment with a biologic should be switched to a different biological agent. In contrast, non-medical switching (NMS) is the switching of biologics in patients with well tolerated, adequate therapy.9–11 Broadly, two types of NMS can occur: between different biological agents of the same class, or more commonly from a reference product to its biosimilar or vice versa.10 12 NMS is typically driven by economic reasons (cost savings and/or procurement policies) and may be enforced through guidelines and/or legislation.9–11 13 14 Less commonly, NMS can be driven by patient preference.9 10 Efficacy, safety, or convenience benefits are not expected from NMS; however, a prescribing physician should be part of the decision and incentives may exist to switch their patients. Where NMS occurs without the involvement of the prescribing physician, this can be considered an automatic substitution. Currently there are no formal recommendations to guide NMS, representing an important unmet need. As discussed below, clinical evidence supports NMS between reference biologic and biosimilar. However, if an NMS decision requires the substitution of one biosimilar for another biosimilar, there is a lack of clinical evidence for physicians to refer to because a biosimilar may not be evaluated against more than one reference for the purpose of regulatory approval.15 16 Consequently, comparability studies are generally performed between a biosimilar and its reference product but not between one biosimilar and another (figure 1). Therefore, NMS between different biosimilars is not desirable from a clinical perspective. 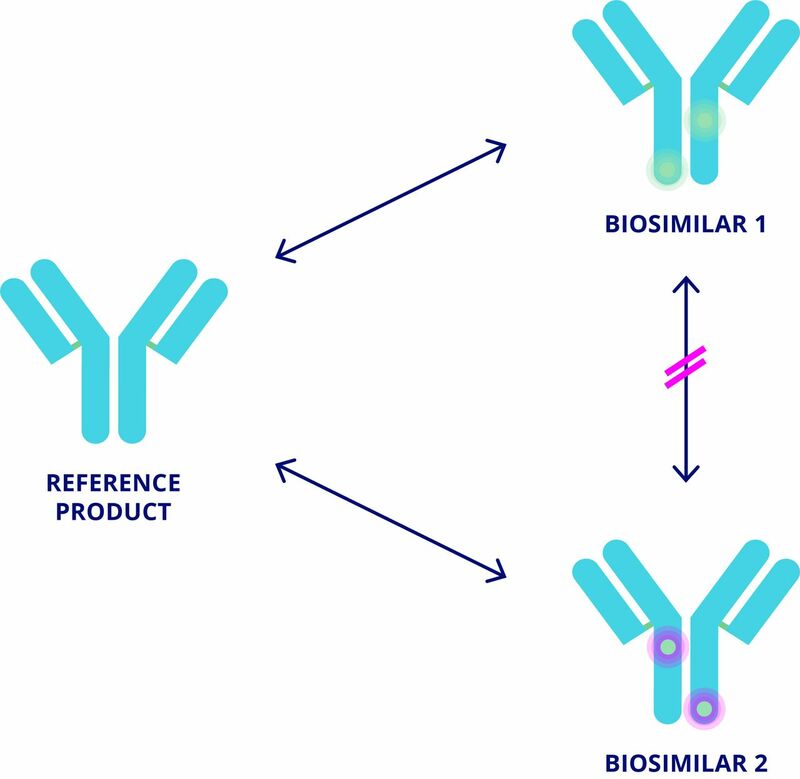 The key concerns when switching to biosimilars are a potential loss of efficacy, changes in immunogenicity with potential secondary failure due to anti-drug antibodies (ADAs), or unanticipated differences in the safety profile compared with the reference product. In addition to unanticipated adverse events, safety considerations include the potential for acute reactions such as injection site reactions (ISRs) or infusion related adverse events compared with the reference product. An awareness of these potential issues by both patients and physicians is of paramount importance. Furthermore, it is imperative that physicians who have jurisdiction over whether to switch from reference to biosimilar have good understanding of important concepts with respect to biosimilarity. Clinicians also need to be aware of the potential for misattributing secondary failures (ie, due to ADAs) to the substitute agent as the onset of an adverse reaction or secondary failure can be delayed. One preventive measure to avoid this could be the routine screening of patients for the presence of ADAs before switching. This approach is feasible given the availability of highly sensitive assays for ADAs.24 Additionally, if ADAs are detected during treatment with the reference product, switching to a biosimilar may not be appropriate. However, additional tests for ADAs are also associated with increased costs. Manufacturers have a role in providing the necessary clinical diagnostic support to enable the physician and patient to make the correct decisions regarding ongoing therapy. Despite the possibility that changes in immunogenicity can theoretically lead to a poorer clinical outcome or secondary failure, there is little clinical evidence to support this occurring to date. Enbrel seems to have slightly higher rates of immunogenicity than the biosimilars SB4, GP2015, and CHS0214,26–28 although conclusions cannot currently be drawn because immunogenicity does not seem to affect efficacy or safety in most of the biosimilar trials, and high concentrations of drug may interfere in the assay and lead to false negative ADA results29 (table 1). Post-marketing surveillance of the complex emerging biosimilars market is critical. As biosimilar treatment options expand, clinicians and patients must be better prepared to identify and report new signals. Existing systems for pharmacovigilance, including registries and adverse drug reaction databases, are likely to be insufficient. For example, registries permit the traceability of biologics to the manufacturer, but they do not support the routine capture of information relating to specific batches.44 Equally, the existing ‘yellow card’ systems and adverse drug reaction databases require the time intensive completion of paperwork, which may not be feasible as an additional administrative burden on top of everyday clinical practice. All dispensing information (eg, drug (including batch information), dose/frequency/duration, patient identifier) and potential adverse effects associated with biological agents (reference products and biosimilars) should be reported to national authorities by pharmacies and healthcare professionals, respectively. The data should then be collated and analysed on a regular basis to identify potential signals. Importantly, relevant findings need to be fed back to clinicians and patients such that clinical practice is adjusted to address any issues.45 To facilitate data collection, existing systems need to be streamlined and online reporting platforms should be established. As the differential narrows, it is important that the overall costs of NMS to biosimilars are balanced against the potential risks to the patient. Following approval, biosimilar products may use different administration routes or injector devices compared with the reference product. Consequently, additional patient training may be needed when switching between products, which requires additional time from physicians, nurses, or patients and is associated with cost implications. Additionally, given the need for increased pharmacovigilance, NMS to biosimilars may require additional monitoring or clinical tests, which are also associated with a cost. In the case of intended copies, these costs may be even higher as greater vigilance is required. In summary, these potential hidden costs should be factored into the overall health economic evaluation when considering NMS to a biosimilar. Patients and clinicians need to understand the potential cost and clinical implications of switching to biosimilars, but almost a decade of experience in clinical practice has thus far raised few concerns.46 Data from clinical trials and real world observational studies that specifically examine switching continue to accrue, providing a growing evidence base to aid clinical decision making. As the availability of biosimilars increases, NMS will serve to reduce overall healthcare costs and permit access to biological agents for a much wider global patient population. In doing so, there is a need for improved pharmacovigilance systems. A greater public and professional awareness of the need and value of pharmacovigilance should be fostered through the dissemination of information to patients, physicians, and payers, as well as provision of education by medical schools, national societies, medical charities, and governments.
. Are we prepared to prescribe biosimilars? Rev Bras Reumatol 2010;50:221–4.
. American College of Rheumatology Guideline for the treatment of rheumatoid arthritis. Arthritis Rheumatol 2015;2016:1–26.
. Analysis of outcomes after non-medical switching of anti-tumor necrosis factor agents. J Crohns Colitis 2015;9:S255.
. Comparison of tiered formularies and reference pricing policies: a systematic review. Open Med 2009;3:e131–9. World Health Organization. 56th Consultation on International Nonproprietary Names for Pharmaceutical Substances. Geneva: WHO, 2013:15–17.
. Biosimilars 2.0: guiding principles for a global “patients first” standard. MAbs 2011;3:318–25.
. Biosimilars already approved and in development. Considerations Med 2017;1:7–12.
. A phase III, randomized, double-blind clinical study comparing SB4, an etanercept biosimilar, with etanercept reference product (Enbrel®) in patients with moderate to severe rheumatoid arthritis despite methotrexate therapy (52-week results). Arthritis Rheumatol 2015;67:2444–6.
. Switching to biosimilars in rheumatology: evidence-based practice. Arthritis Rheumatol 2016;68:839–41.
. 2957 Evaluation of efficacy and safety of ABP 501 in a phase 3 study in subjects with moderate to severe plaque psoriasis: 52-week results. J Am Acad Dermatol 2016;74:AB249.